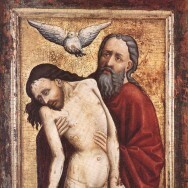 Glory be to the Father, and to the Son, and to the Holy Spirit, as it was in the beginning, is now, and will be forever. Amen. Alleluia. This doxology begins each hour of the Liturgy of the Hours–words deeply familiar for most religious sisters and all priests. The most astounding and disturbing things I read on the Sinsinawa Dominicans’ email discussion list archive SinsinOP were the discussions about what language to use for the Divine Persons of the Trinity, instead of “Father, Son, and Holy Spirit.” Some speak of wanting a greater variety of words for God and flexibility; others are very radical and want to do away with all male language for God: “I no longer relate to God as father or ever use the word ‘he’ when speaking about God,” wrote Sister Patty Caraher in 2009. She’s not alone. Many Sinsinawa Dominican Sisters say they don’t want to renew their vows with the traditional formula that begins “To the honor of Almighty God, Father, Son, and Holy Spirit…”; when a vote was taken only a slight majority of 54% wanted no change. Some wish they could change their Constitutions to remove all male language for God–but know the Vatican would not go along with it. The Dominican Sisters’ Liturgy of the Hours-style prayerbook Dominican Praise uses a novel and genderless doxology: “Blessed be our saving God, Creator, Christ and Spirit, now and forever. Amen.” This is not simply neutral. There are obvious and grave theological problems with refusal to speak of God as Jesus’ Father, or refusal to speak of Jesus as a man. Let us begin with liturgical prayer. 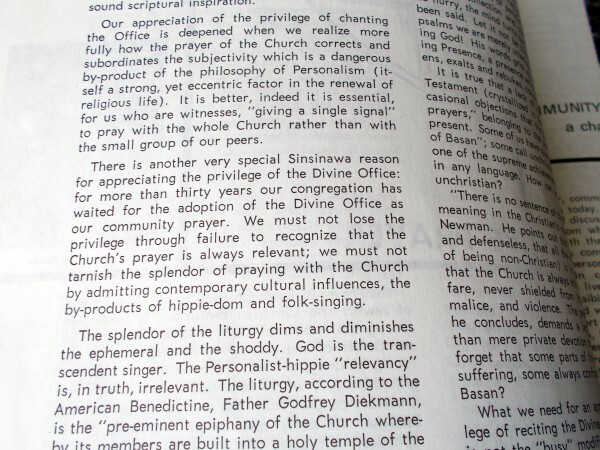 In the June 1969 second issue of the Sinsinawa Dominican publication for congregational change, exCHANGE, Sister Julie Garner wrote an article on Contemplative Prayer in which she also voiced concerns about how the culture of the ’60s seemed to be affecting liturgy. Feminist language wasn’t yet the big thing, but she still felt the need to point out that they’d waited a long time for the privilege of praying the prayer of the Church (the Liturgy of the Hours aka the Divine Office–the Church’s official public prayer, together with the Mass), and she saw a danger that although that has finally been granted and encouraged by Vatican II, it would not not be appreciated by sisters, or the way of praying it tarnished by hippie culture. 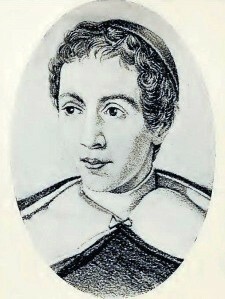 Father Cyril Wahle, OP wrote in the introduction to the old Office Book for Dominican Sisters: “The purpose of our prayer is first, the glory of God whose incomprehensible perfections we exalt whenever we say: ‘Glory be to the Father, and to the Son, and to the Holy Ghost’.” This doxology has been in use since the fourth century, and had to be defended at that time because the Arian heretics wanted to make the Son less than the Father, as one can find out all about by reading Saint Basil the Great. 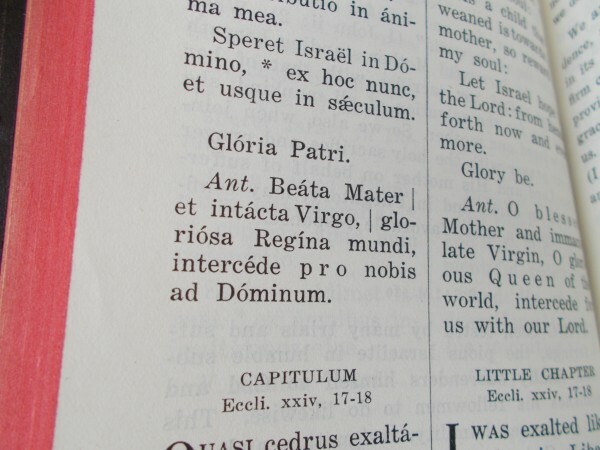 In our own day, the error that militates against this prayer, is that motivated by a “liberationist” feminism, that says that “Father”, “Son” or any other masculine terms are not truly eminently fitting terms for God, but are limiting and come out of a particular culture, and should be eradicated. This was part of the liberationist (marxist) feminist program of changing meanings and practices in the Church to “correct” what was perceived or claimed to be marginalization and oppression of women. We can no longer burden our imaginations with a deadly literalist understanding of God language. Vatican Council II released us from that burden. I agree with Elizabeth Johnson and Catherine LaCugna that the use of “Father” and “Son” presents a difficulty from a feminist perspective. And I am grateful to [those who are] urging us to find language that expresses “the ancient mystery of the Trinity.” That is not only our work as Dominican women but as women in the Church. The whole Church needs to and is finding new metaphors and images to add to the Tradition. LaCugna says that “the insights of trinitarian theology should free our imaginations without forcing us to abandon our tradition.” But we need to realize that no metaphor, neither Father, Son, nor Holy Spirit can be understood in a literalist way. If Mary is the mother of Jesus, and it is a non-literal metaphor that God is Jesus’ Father, who do they imagine is Jesus’ other parent? 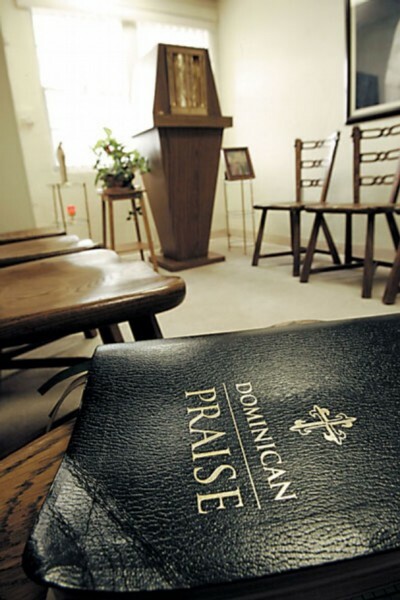 In the late 90s, Sisters from 18 different Dominican congregations began to work to bring about “the creation of a Dominican Women’s Prayer Book that incorporated the Liturgy of the Hours and specific Dominican emphases. Since the license for ICEL is frozen, we formed committees and have been working assiduously.” ICEL is the International Committee on English in the Liturgy, the body that holds the copyright for Catholic liturgical texts (such as the Liturgy of the Hours) in English translation, and licenses them to publishers. These ecclesiastically approved liturgical texts cannot be altered, which may be what is meant by saying “the license for ICEL is frozen”. Who has looked lovingly on me in my affliction. is to those who stand in awe…. The book includes some non-scriptural “alternative readings” for Morning or Evening prayer, which include several by Dominican Sister Mary Catherine Hilkert, I think a couple from Vatican II documents, one from the 1986 USCCB document “Economic Justice for All,” and even one by controversial feminist/panentheist theologian Sister Elizabeth Johnson. Sister Kaye Ashe’s 1997 The Feminization of the Church?, written about the time the Dominican Praise project was getting started, refers to to “Numerous committees and commissions” at work on “inclusive language translations of the Bible, lectionaries, hymns and prayer books,” whose “brave efforts have not been spared caustic criticism,” as she illustrates by quoting James J. Kilpatrick writing in the Washington Post: “vandalism of this magnitude ought not to go unremarked.” The Sinsinawa Dominicans ordered a total of 391 copies of Dominican Praise, of the total 2005 edition of almost 5,000 copies, published by Liturgy Training Publications (LTP). The competent superior has the power to grant the use of the vernacular in the celebration of the divine office, even in choir, to nuns and to members of institutes dedicated to acquiring perfection, both men who are not clerics and women. The version, however, must be one that is approved.